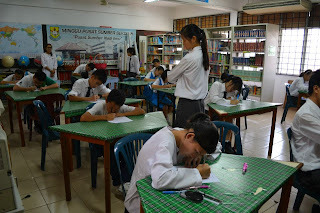 Just several weeks ago, we Librarians had our annual Librarian Qualifying Examination. 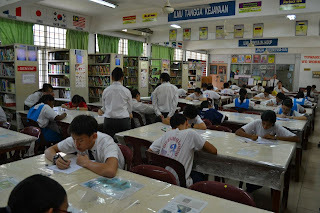 To the uninitiated, all Librarians, except for the fifth-formers, are required to take the examination to determine their competency in carrying out their duties. 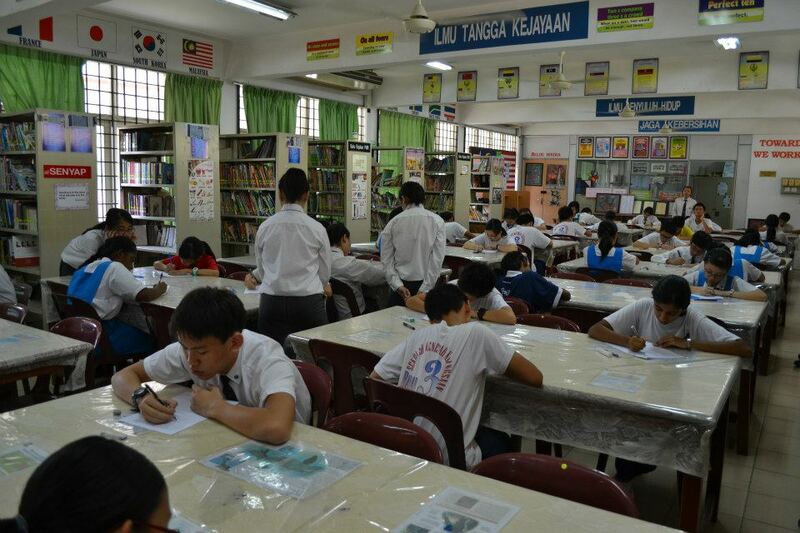 Usually, the examination would consist of general knowledge of the school and the Library, the school's and the Library's administrative hierarchies, basic inventory work, and duties as a Librarian. It seems like a lot to prepare for, but four years of remembering would turn it to a cinch! 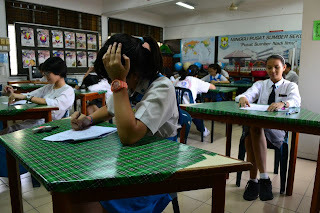 Anyways, as a fifth-former, I was charged with looking after the probationary Librarians (that is, the ones who just joined us), and then I remembered my first examination, which was scary and nerve-wrecking. Their faces were just like mine, fearful and under tremendous pressure. I remembered when Mr. Wong Tzyy Yu (our current Senior Assistant of Student Affairs) used to scare us with his no-nonsense tone and keep us all in line. He was so demanding, that he actually said that the passing mark of the examination was at 80%! Anyways, when I got back home, I retrieved my old notebook, which contained my notes for the examination, and how remarkable they looked after 5 years! Most of it is the same, and the hierarchy has understandably changed, but there is one remarkable change that compels me to share with all you people out there. 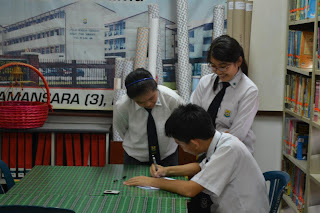 However, as I dig through my notes, our school's vision was 'Sekolah Menengah Kebangsaan Bandar Utama Damansara (3) cemerlang tahun 2012', which was to lead our school to excellence by 2012, and its mission is, 'Beriltizam untuk memberi pendidikan berkualiti cemerlang; pengalaman belajar yang menarik dan menyeronokkan; suasana pengajaran dan pembelajaran yang selesa, selamat dan kondusif; kegiatan kokurikulum yang memberangsangkan; dan membentuk potensi diri ke arah mendidik' (and the equally long translation is: Aspiring to give an education of excellent quality; an interesting and fun learning experience; a comfortable, safe and conducive teaching and learning environment; robust co-curricular activities; and to shape self-potential towards a nurturing self). So, here's the question that came to mind: what's with the change? Well, I looked around the school, and there has been so many changes in my five years of secondary school life. First off, the vision. As you can see in the 'About our School' page, our school was recently recognised as a Cluster School of Excellence in the fields of science and basketball (an unlikely combination). Though everyone was sceptical about getting it when we were inspected, we have proved them wrong and have in fact achieved our vision. Hence, the old vision is achieved. Next, the mission. I think, if you meet any of our alumni, I guess that the majority of them would say that the school does provide a great education, and has nurtured them to where they are now. Even our co-curricular achievements are exemplary, especially with the crowning jewel of sweeping clean the champion trophies at the recent district-level basketball tournament. Hence, the mission is achieved. After that digression, I think that all this is enough for one blog post, and I hope to see you guys soon!